Thai Massage is called by a multitude of names including Thai Folk Massage, Thai Physical Therapy, Thai Yoga Massage, Thai Yoga Bodywork, Thai Bodywork, The Moving Meditation, Thai Medical Massage, and Sacred Thai Healing. The particular style we offer as a service at Scents of Serenity is of Lanna (Northern Thai) tradition and has roots in Reusi healing methods. Massage is one root of therapeutic practices grown out of a culture whose focus is nature, health, longevity, and the generation of good will. As called in it’s native language Gaai Ya Paap Bam Bat, Thai Folk Physical Therapy is a massage form that uses element-based analysis techniques which create balance in the body systems by easing the relationship between the five layers of the physical body, aka skin, tissue, channels, bones and organs. This rejuvenating treatment decompresses and cleanses your physical body by directly soothing the muscular, skeletal, nervous, and digestive systems. It quiets the mind, settles the body and frees tension allowing the body to work more efficiently with an aligned range of motion. Each session is unique and addresses body ailments as they arise and can be used preventative care for future illness. Thai Massage sessions begin with a lifestyle consultation, which will asks questions about body aches, daily habits, occupation, and physical patterns, giving our Thai Massage Therapist, Malia, a general understanding of the movements and ailments of your body. During your session, she will use her hands, elbows, forearms, knees, and feet to sense and soothe muscular constrictions. Your session flow through a combination of muscle compressions, trigger point release, and passive stretches to your joints, and may include the use of steaming herbal bundles, fire cupping, spoon scraping, scarf wrapping, and dhee (beating) techniques to therapeutically soothe ailments. Homemade Thai herbal oils and lineaments may be added to sessions that require deep work and abdominal therapy. Our massage sessions are practiced on a thick comfortable mat with supportive pillows and a face cradle if needed. For total comfort, we prefer our clients to attend sessions in dark clothing that is easy to move in, long pants and shoulders covered is welcomed. Thai Bodywork is an hour and a half long healing session during which, the practitioner uses their palms, elbows, knees and feet to compress muscles, simulate acupressure points, and gently stretch the body allowing it to relax, open, and literally decompress. The Thai method traces and clears energetic pathways which cover all muscle groups and organs, refreshing the major body systems. Called the Moving Meditation, this intricate, fluid, and intuitive cleansing series, promotes deep relaxation within the body and stillness within the mind while alleviating all types of ailments and injuries, leaving you feeling calm and centered. Thai bodywork is practiced on a thick comfortable mat on the floor and for total ease the client remains fully clothed. 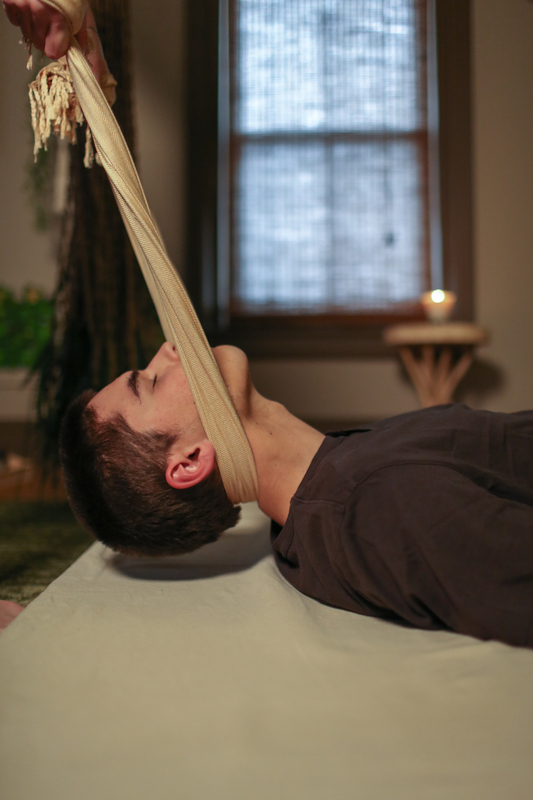 *This bodywork is completely passive, so you will be totally relaxed while the practitioner moves the body. Nothing with zippers. No jeans or khakis or shorts. Table Thai Massage offers the client the ability to receive some of the same benefits and modalities of traditional Thai Massage while on the massage table rather than on a thick mat on the floor. 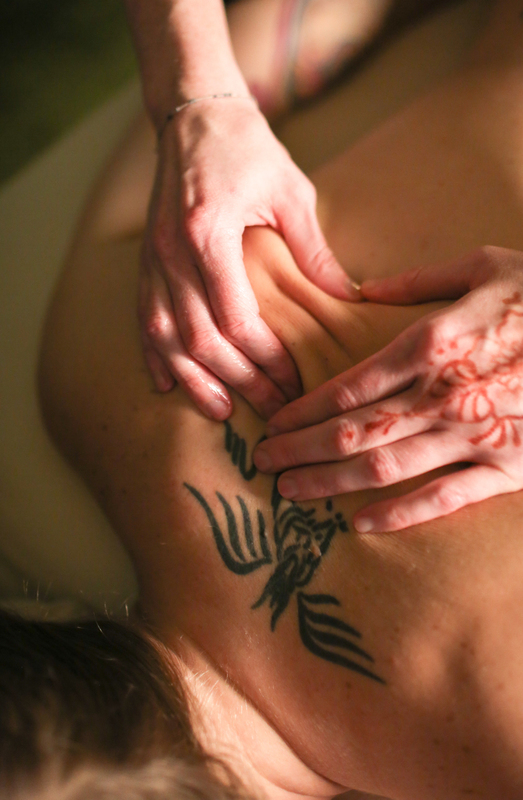 Experience a truly peaceful session for both the mind and body during this 90 minute massage. 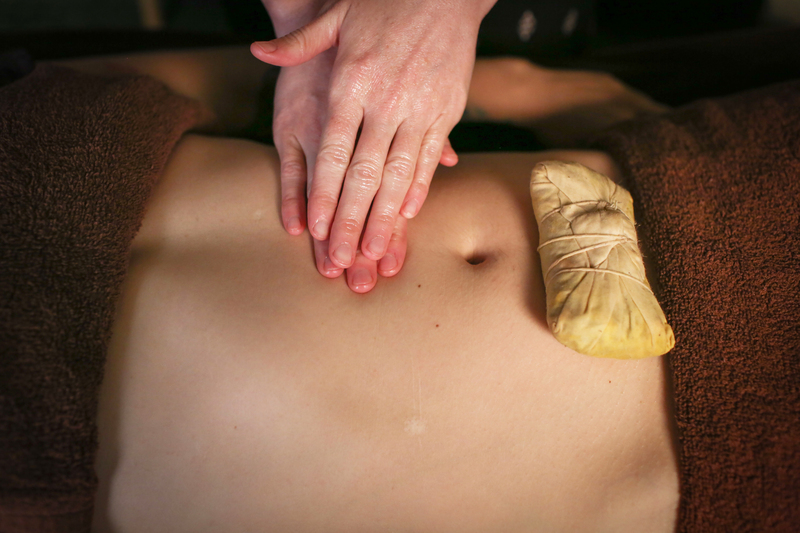 Gentle, comforting massage is performed on the belly slowly opening the layers of the abdomen. Using a special blend of oils and herbs to deepen the release while soothing, detoxifying, and warming the belly. Each session ends with calming stretches for the front of the body leaving you feeling open. This massage is performed with only the belly modestly exposed while the guest is fully clothed. Some benefits of belly massage include reduced low back pain, balanced digestion, decreased bloating, reduced anxiety, and deeper breathing. Each session begins with a warm cup of tea to enhance the benefits of this comforting session. Experience the meditative and deeply relaxing techniques of Thai massage by booking this mini session. This mini session is great for those curious of what a Thai massage session entails and how it can help specific ailments and injuries. 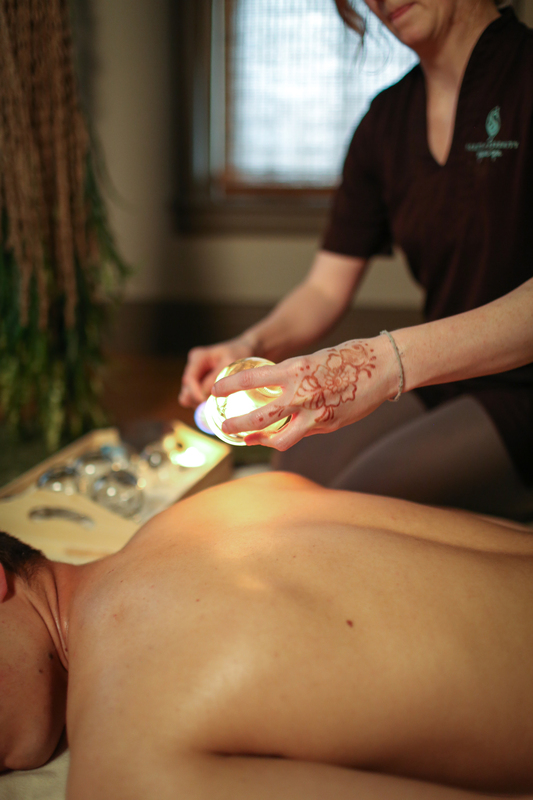 Cupping is an ancient practice that is in essence like trigger point work. The cups lift the body’s layers off one another to allow space for increased circulation and draining of the area, thereby nourishing the muscles and surrounding tissues. Fire is used to create a suction with the cups which is comfortable and can vary in intensity. Our 60 minute option will include 3o minutes of upper body work followed by cupping and the 90 minute option will include 60 minute massage (full body or upper body) followed by 30 minutes of cupping. Please note that you may experience discolorations that can occur from the release and clearing of stagnation and toxins from the body. These are not bruises and are not permanent. 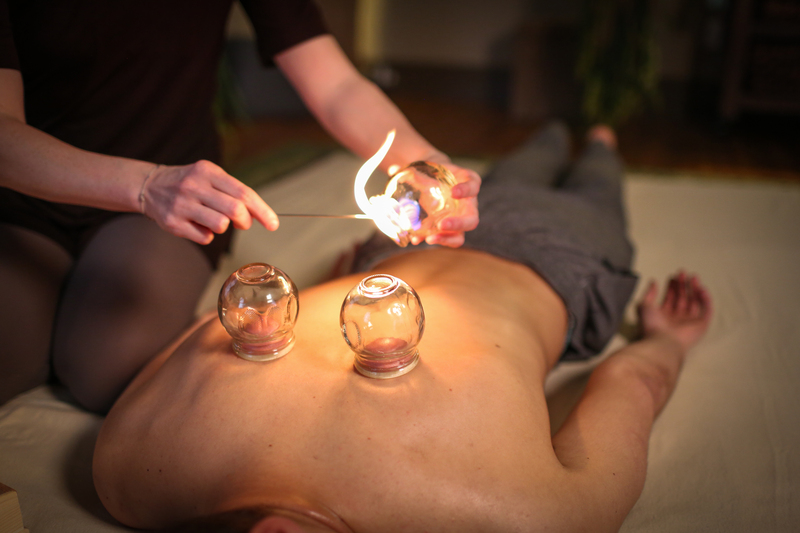 Firing cupping is included at no additional cost during the Thai Massage or Table Thai Massage service if the practitioner finds it beneficial to incorporate in the session and will depend on the clients needs at the time of services. If fire cupping is added, it will be discussed prior to the service. The pricing option below applies only when cupping is added on as an enhancement to any of our other massage therapy services outside of Thai and Table Thai Massage.